Hazard ratios are ubiquitously used in time to event applications to quantify adjusted covariate effects. Although hazard ratios are invaluable for hypothesis testing, other adjusted measures of association, both relative and absolute, should be provided to fully appreciate studies results. The corrected group prognosis method is generally used to estimate the absolute risk reduction and the number needed to be treated for categorical covariates. The goal of this paper is to present transformation models for time-to-event outcomes to obtain, directly from estimated coefficients, the measures of association widely used in biostatistics together with their confidence interval. Pseudo-values are used for a practical estimation of transformation models. Using the regression model estimated through pseudo-values with suitable link functions, relative risks, risk differences and the number needed to treat, are obtained together with their confidence intervals. One example based on literature data and one original application to the study of prognostic factors in primary retroperitoneal soft tissue sarcomas are presented. A simulation study is used to show some properties of the different estimation methods. Clinically useful measures of treatment or exposure effect are widely available in epidemiology. When time to event outcomes are present, the analysis is performed generally resorting to predicted values from Cox regression model. It is now possible to resort to more general regression models, adopting suitable link functions and pseudo values for estimation, to obtain alternative measures of effect directly from regression coefficients together with their confidence interval. This may be especially useful when, in presence of time dependent covariate effects, it is not straightforward to specify the correct, if any, time dependent functional form. The method can easily be implemented with standard software. Measures of disease frequency and measures of associations derived from them are among the basic building blocks of biostatistics and epidemiology. The appropriateness of the use of a specific measure of association may depend on the study objectives and design. Sometimes, however, the use of specific measures of association depends also on the statistical methods available for estimation. For example, in epidemiology, a debated subject concerns the use of odds ratios, estimated through logistic regression, in cohort studies of common outcomes [1, 2]. When time-to-event outcomes are analyzed, the presence of censoring calls for specific methods of analysis . The evaluation of the effect of a treatment in a controlled trial can be performed through the graphical display and comparison of Kaplan-Meier curves at selected times, when adjustment is not required. Otherwise, the measure of effect generally considered is the adjusted hazard ratio estimated by means of Cox proportional hazard model, ([4, 5]). However, the clinical literature in randomized controlled trials suggests the use of absolute measures of effect to assess the effects of a treatment, such as risk difference or the number needed to be treated, which are better suited than relative measures of effect for clinical decision support, see [6–10] among others. Schechtman highlights how relative measures are appropriate for summarizing the evidence while absolute measures for the concrete application in a clinical setting, . The need for alternatives to hazard ratios, a relative measure of effect based on (instantaneous) incidence rates, is increasing in medical/epidemiological literature. In particular, the possibility to provide absolute measures of association computed using adjusted survival curves was explored in literature [12–14]. To precisely define the different measures of association in time-to-event applications, it is useful to distinguish between the risk of the event, F(t), i.e. the probability of a patient having the event over a defined follow-up time, and the event rate, λ(t), i.e. the number of events in a specified follow-up interval divided by the time at risk accumulated during the interval. The instantaneous hazard rate is obtained when the interval length approaches 0. The hazard rate at time t refers to the population survived until time t, while the risk refers to the whole population. The measures considered in this paper refer to ratios and differences between the risk of event of different groups of subjects. Let F 1(t) and F 2(t) be the event risk by t in two groups of subjects, (exposed and non exposed, standard treatment and new treatment), then we define the risk difference as R D(t)=F 1(t)−F 2(t). It is useful to translate R D(t) expressed as a percentage measure in a measure more sensible form a clinical perspective. To this end it is usual to use the number needed to be treated N N T(t)=1/R D(t) which is interpreted as the expected number of patients needed to be treated to avoid one additional death compared to the untreated. The measure has its roots in clinical trial literature and was extended in an epidemiological framework as the number needed to be exposed, N N E(t), i.e. the expected number of subjects to be exposed to have one additional event compared to the unexposed. In observational studies, an alternative definition of N N E(t) is the exposure effect among the unexposed, while the exposure impact number, E I N(t), describes the effect of removing the exposure among the exposed [15–17]. It is also interesting to define a relative risk, RR ( t ) = F 1 ( t ) F 2 ( t ) , to be contrasted with the hazard ratio, HR ( t ) = λ 1 ( t ) λ 2 ( t ) . The different measures of effect are in general time-varying. In certain situations, however, they are estimated as constant through follow-up, as it happens for example with the Cox proportional hazard model for the hazard ratio. When the measure is assumed to be constant during follow-up the time dependence is omitted (i.e., H R(t) is written as HR). The purpose of this paper is to provide an outline of the methods generally adopted to estimate adjusted summary measures of associations, different from the hazard ratio, in time-to-event studies and to present a new method based on transformation models. The focus of this paper is not to provide guidance about which association measure should be used in different situations, but simply to provide an estimation method. Moreover, particular attention will be given to the estimate of adjusted R D(t). In fact, absolute measures of association are particularly advocated in survival analysis, to be combined with the generally used hazard ratio. A small simulation study is provided to show a preliminary evaluation of the properties of the different estimation procedures. Two examples are then developed. The first concerns literature data on a clinical trial on 506 prostate cancer patients . The goal is to estimate the treatment R D(t) and N N T(t) with their confidence intervals. A comparison of the model based estimated R D(t) with that obtained with the classical corrected group prognosis method  is provided. The second application concerns an observational study of prognostic factors in primary retroperitoneal soft tissue sarcomas . In many situations a researcher is interested in providing adjusted estimates of covariate associations with the outcome. In observational studies (involving no randomization) the exposure effect has to be adjusted for known confounders. Also in randomized controlled trials (RCT) the use of adjusted estimates is suggested for example to account for potential covariate imbalances or since prognostically relevant covariates were considered for a stratified randomization [20–22]. In these cases, Cox regression is widely used to adjust the estimated association between the covariate of interest and outcome for the other covariates. 1 Ŝ ( t | T = 1 , A = 40 , G = 1 ) − Ŝ ( t | T = 0 , A = 40 , G = 1 ) . where Ŝ ( t | T = 1 , A = 40 , G = 1 ) is the estimated survival probability for a male 40 years old in the experimental treatment group, given by [ Ŝ 0 ( t ) ] exp ( α ̂ + β ̂ 40 + γ ̂ ) , while Ŝ ( t | T = 0 , A = 40 , G = 1 ) is the estimated survival probability for a male 40 years old, in the control group, given by [ Ŝ 0 ( t ) ] exp ( β ̂ 40 + γ ̂ ) . Ŝ 0 ( t ) is the baseline survivor function from a Cox proportional hazards model estimated according to one of the available methods [23, 24]. In order to obtain adjusted measures of association, different from the hazard ratio, the Cox proportional hazard model is used to estimate adjusted survival curves  as outlined in the following paragraphs. The simplest approach for obtaining adjusted survival curves is the average covariate method. The mean values among the study patients of the covariates used for adjustment are plugged into the multivariable Cox proportional hazard model. Considering the above example, if the mean age of subjects in study is 45 and 30% males are included, the adjusted NNT ̂ ( t ) for the treatment will be 1 Ŝ ( t | T = 1 , A = 45 , G = 0.3 ) − Ŝ ( t | T = 0 , A = 45 , G = 0.3 ) . The average covariate method was once popular and largely adopted, due to its simplicity, but it was severely criticized [25, 26]. In fact it involves the averaging of categorical covariates, such as gender, which is difficult to understand. Moreover the method provides an estimate of the measure of effect for an hypothetical average individual and not a population averaged estimate. A Multivariable Cox (or fully parametric) regression is used for the treatment and the covariates. the same predictions are obtained and averaged assuming each subject is in the control group. the difference between the averaged predicted probabilities between experimental and control group is an estimate of the adjusted R D(t) for the experimental treatment at the specified times. Pointwise confidence intervals of the obtained R D(t) estimates may be computed via bootstrap resampling . For each bootstrap sample, i.e. a sample of the same size of the original one and randomly drawn with replacement from it, the R D(t) is computed according to the procedure outlined. A non parametric bootstrap 95% pointwise confidence interval is obtained resorting to the 2.5 t h and 97.5 t h percentiles of the obtained R D(t) bootstrap distribution. A simulated example of the estimation of R D(t) in presence of confounding is exemplified in Figure 1. Simulated data: R D ( t ) and Kaplan-Meier Curves. Estimation of R D(t) associated with an hypothetical experimental treatment using artificial data simulated from a proportional hazard model (Details on the simulation are reported in the manuscript). The treatment effect is confounded by two covariates. 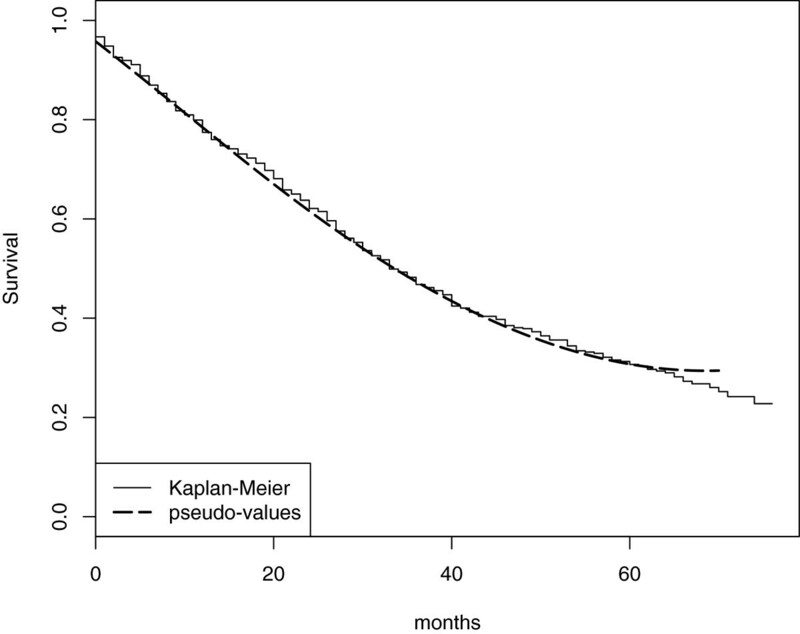 The unadjusted Kaplan-Meier survival probabilities (- - - -) are reported together with the adjusted estimates (—–) obtained with the corrected group prognosis methods (left panel). The corresponding R D(t) estimates are reported in the right panel together with the model based constant RD estimate (with confidence interval). The CGPM can be applied in principle to whatever regression model and an adequate model must be chosen. Considering, for example, the Cox regression model, in presence of time dependent covariate effects, an interaction of the covariates with a pre-specified function of time should be specified, in order to estimate H R(t) varying during follow-up time. It is important to remark that it is not always easy to specify an adequate model in presence of time dependent covariate effects. In fact it is not always obvious how to model the time dependence itself. In general simple functions of time (linear or logarithm) or more flexible alternatives are used, . To allow the estimation the data set must be augmented as it is done for true time-dependent covariates . It is to be remarked that, although the use of predicted values from regression models is simple from a practical point of view, the standard way to obtain summary measures of effect and their confidence interval is to use directly regression model coefficient estimates. The CGPM applied to the Cox model will be used for comparison with the method here proposed and described in the following section. Laubender and Bender, , proposed different averaging techniques to estimate relevant impact numbers in observational studies using Cox model. For the purpose of illustration, let us consider the same example as before simply considering an exposure (E) instead of treatment. To obtain an estimate of N N E(t) it is possible to average predictions considering the subjects as if they were unexposed and as if they were exposed and taking the difference. As the distributions of the covariates used for adjusting are in general different in the exposed and unexposed groups, two different measures should be considered. Specifically, the estimate of the N N E(t) is obtained considering the unexposed subjects only, while E I N(t) is obtained considering the exposed subjects only. A comparison of the model based estimated R D(t) with that obtained through different averaging techniques, namely N N E(t) and E I N(t) [13, 15], is provided in the second example. However, the focus of the paper is not the comparison of different averaging techniques which are provided only for illustrative purposes. In particular, only the estimates obtained through the averaging performed over the whole population are compared with those based on transformation models methods. Adjusted model-based estimates of measures of association can be obtained resorting to a general class of regression models used in Survival Analysis called transformation models . Considering the previous example, the transformation model can be written as g(S(t|T,A,G))=g(S 0(t))+α T+β A+γ G.
where n is the sample size, Ŝ ( t ) is the survival probability based on the Kaplan-Meier estimator using the whole sample and Ŝ − i ( t ) is the survival probability obtained by deleting the i subject from the sample. When no censoring is present in the data, the pseudo values for subject i at time t is simply 1 if the subject is alive at t, while it is 0 if the event happened by t. Suppose to have an exposed male, 40 years old, which dies after 30 months of follow-up. The pseudo values computed at 12, 24 and 36 months are equal to 0, 0 and 1 respectively. The times at which the pseudo-values are computed are called pseudo-times. When censoring is present in the data, pseudo-values are still defined for each subject (even those censored) and for each time, but the values may also be less than 0 or greater than 1 (See ; page 5310–11 for further details on the properties of pseudo-values). In general, to allow inference on the entire survival curve, M (greater than 5) pseudo times are used, considering, for example, the quantiles of the unique failure time distribution. As M pseudo values are computed for each subject, an augmented data set is created with M observations for each subject. The pseudo-values are then used as responses in a regression model for longitudinal data, where time is a covariate. As no explicit likelihood is available for pseudo-values, generalized estimating equations (GEE), , are used accounting for the correlation of the pseudo-values within each subject. The cluster robust variance-covariance is used for hypothesis testing using Wald tests. In general an independence working variance-covariance matrix can conveniently be used in the estimation process . In order to model g(S 0(t)), the transformed baseline survival function, the standard procedure is to insert in the regression model indicator functions for each pseudo-time. If all event times would be used to compute the pseudo-values, the insertion of indicator functions would result in a non parametric representation of the (transformed) baseline survival, as in the Cox model. In general only a small number of pseudo-times are used obtaining a parametric baseline representation. As an alternative, spline functions can be inserted in the regression model, as did  in a non-pseudo-values framework. where B 1(t) and B 2(t) represent the first and second spline bases for time t. For example, if a restricted cubic spline basis is used with three knots at k 1,k 2,k 3, then B 1(t)=t and B 2 ( t ) = ( t − k 1 ) + 3 − ( t − k 2 ) + 3 ( t 3 − t 1 ) ( t 3 − t 2 ) + ( t − k 3 ) + 3 ( t 2 − t 1 ) ( t 3 − t 2 ) , where, for example, ( t − k 1 ) + 3 is equal to (t−k 1)3 if t>k 1, otherwise is 0. Knots are chosen at quantiles of the failure time distribution. In the case of 3 knots the quantiles commonly suggested are 0.1, 0.5 and 0.9, . To choose the complexity of the spline the QIC, , an information criterion proposed for generalized estimating equations, can be used. A less formal strategy is the graphical comparison between the Kaplan-Meier marginal survival probability and the marginal probability obtained from the transformation model without covariates. Such a procedure will be used in the examples. The first part of the model, ϕ 0+ϕ 1 B 1(t)+ϕ 2 B 2(t), provides a parametric representation of the (transformed) baseline survival function, g(S 0(t)), during follow-up time. The coefficients α, β and γ represent the covariate effects expressed as differences in the Survival probability, transformed by g associated with a unit increase in the covariates. Let us consider such an issue in detail. When g is the logit link function, a proportional odds model is estimated. Accordingly, α, β and γ represent the logarithm of the ratio of the odds of surviving associated with the change of one unit in the covariates. Such an effect is constant through follow-up times. The exponentiation of the parameter estimates represent therefore the ratio of the odds of surviving. Similarly, the logarithmic link produces a proportional risks model and the e x p(α), e x p(β) and e x p(γ) represent the ratio of the survival probabilities (Relative Risks, RR). The identity link produces a constant survival difference model: α, β and γ represent the adjusted differences in survival probabilities (risk differences, RD). A constant difference model through follow-up is often not practical as a model such that at the beginning of the follow-up the survival curves start at 1 and then, eventually, become different. However, it is to be noted that the first pseudo-time is never placed at time 0, but later on the follow-up time scale. In Figure 1 an example of the model based RD estimate with pointwise confidence intervals, constant through time, is reported in the right panel. The constant model estimated RD can be used to obtain a constant estimate of NNT by inversion. In the case of treatment T: NNT ̂ = [ α ̂ ] − 1 . The value of 1 indicates the largest possible effect of NNT, while in correspondence of no covariate effect (RD=0) the NNT value is ±∞. The largest possible harmful effect is −1. Positive and negative values of NNT represent the expected number of patients needed to be treated for one additional patient to benefit and to be harmed, respectively. In the case of the log-log link, g=l o g(−l o g(•)), e x p(α), e x p(β) and e x p(γ) are the ratio between cumulative hazard functions associated with the change of one unit in the covariates. This ratio is equal to that of hazard functions, only in the proportional hazard case. The method allows to estimate the measures of effect also for continuous covariates. For example, the evaluation of a biomarker effect measured on a continuous scale, without cutoffs, is still possible with this methodology. The use of different link functions to obtain a particular measure of effect, is an established technique in binomial regression, where the use of non-canonical links, such as the logarithm, allows to obtain adjusted measures of impact different from the odds ratio, [1, 38]. Wacholder, , is an excellent reference for deepen such aspects in the framework of logistic regression. When there is evidence for time dependent effects of the covariates, the interaction between the covariates and the spline bases B 1(t) and B 2(t) are included in model (3). In such a case, the estimated g-transformed survival probability differences change during follow-up time. In order to show the effect, varying in time, of a dichotomous covariate, for example treatment T, it is useful to adopt a graphical display, where the time is put on the horizontal axis while the function e x p(α+γ 1 B 1(t)+γ 2 B 2(t)) is on the vertical axis (exponentiation is not used with the identity link; R D(t)=α+γ 1 B 1(t)+γ 2 B 2(t)). In this case the estimated N N T(t) is naturally varying through follow-up time and again obtain by inversion: R D(t)−1. For a continuous covariate, such as Age, A in the example, it is possible to use a surface plot, where Age and time are on the x and y axis, while the z axis reports the covariate effect with respect to a reference value. It would also be possible to model Age effect with spline bases. In this case, the interaction between Age and time is obtained through tensor product spline bases of Age and time. When a large number of pseudo-times is used, spline functions allow to model parsimoniously the baseline risk compared to indicator functions. This is particularly important for the modelling of time-dependent effects in connection to the different link functions. In principle when a covariate effect is constant using a specific link, it should be time-varying with the other links. No statistical evidence against a constant covariate effect for more than one link may only be due to lack of power. The problem can also be exacerbated by some multiple testing issue. Time-dependent effects selection depends therefore on the link transformation used. As a consequence, the adjusted effect of a covariate may be constant using a link function, but time-dependent using a different link. Moreover, the fitted values of the different models selected for the different link functions are generally different, being equal only if the models are saturated. Traditionally, the strategy used in the application of transformation models such as (3) was to select the best fitting g transform, i.e., the transform where covariate effects are constant through time, see [40, 41] as examples. The approach considered here is different. The interest is in using the g-transform which is the most informative for the clinical or biological counterpart. Generally the best fitting link function and the one selected by the researcher are not the same. Time dependent effects should therefore be expected in the model. where st.error ( α ̂ ) is the estimated cluster-robust standard error for the model parameter α. When g is the log, logit or l o g−l o g link function, the 95% CI for the treatment effect (respectively an RR, OR or HR) is [ e x p.(l lower ),e x p(l upper )]. With the identity link, the 95% confidence intervals is [ l lower ,l upper ], without additional transformations, and the corresponding interval for NNT is [ 1/l upper ,1/l lower ]. A Clarification is necessary for the confidence interval of the NNT. where V(•) stands for the cluster-robust variance, while C o v(•,•) stands for the cluster-robust covariance of two random variables. When the variances at the different times are calculated, the pointwise 95% CI can be computed as before. The approach to censored data regression based on pseudo values was applied to regression models for the cumulative incidence functions in competing risks and for multi-state modeling , for the restricted mean  and for the survival function at a fixed point in time . Implementation details and software can be found in Klein et al., , and Andersen and Perme, . Software is available to compute pseudo values (macro %pseudosurv in SAS and function pseudosurv in R package pseudo) Standard GEE tools available in SAS or R can be used for regression. In SAS the proc genmod allows to change link functions using the instructions FWDLINK and INVLINK. In R, the package geepack can be conveniently used, see  for details. where the variable pseudo contains the pseudo values and the variable tpseudo the pseudo-times according to the software reported in . The R function rcs of the package rms, , is used to compute restricted cubic spline bases. Each subject is represented by multiple rows in the data, one for each pseudo time. The records for each subject are identified by means of the variable id which is used to estimate the robust standard error by the geese function. Using the identity link function, the estimated coefficients can be interpreted as the adjusted R D(t) estimates. The estimation of R D(t) through pseudo-values is evaluated through a simple simulation study. Moreover, two real examples are presented. The first example concerns a prostate cancer trial, well known in competing risks literature, to show a situation where proportional hazard fail to model the treatment effect during the whole follow-up. The second example regards the analysis of prognostic factors in an observational study of primary retroperitoneal soft tissue sarcoma patients. R software, , was used for the simulation and both the examples presented. Pointwise confidence intervals for the CGPM are calculated using percentile bootstrap (200 bootstrap samples for each simulated data set). R D(t) is estimated by transformation models using pseudo values and the identity link. The baseline cumulative risk is modelled using a restricted cubic spline with 5 knots at 5%, 25%, 50%, 75% and 95% quantiles of the failure time distribution. In the pseudo value model the Z covariate is inserted either without and with an interaction with the baseline risk (i.e. estimating a constant RD, and a time-dependent R D(t) through follow-up time). The estimated RD and R D(t) at times 200, 400 and 600 are collected and compared with the true values. Such times are chosen to be sure that they are between the first and the last pseudo-times in all simulations. The results are analyzed in terms of bias, root mean squared error, average length and coverage of the 95% confidence intervals. The results are reported in Table 1. CGPM was adopted using the Cox proportional hazard regression model. PV model was adopted with identity link. Pseudo times were fixed at quantiles 5%, 25%, 50%, 75%, 95% of the failure time distribution. The Z covariate was inserted in the PV model with an interaction with the baseline risk function modelled with a restricted cubic spline with 3 knots (Z td) giving an estimated risk difference varying through follow-up time, RD(t), and without time-dependence to estimate a constant RD through follow-up time between the first and the last pseudo-times (Z const). R D(t) estimated through the CGPM using the Cox proportional hazard regression model (the model used to generate the simulation data) is used as the benchmark estimation method. The method based on pseudo-values with Z time dependent appears effective especially in terms of bias. Confidence interval coverage is good, although the width of the confidence intervals with pseudo-values is fairly large. It is interesting to observe the results of pseudo-values with the covariate Z not time dependent. In this case the estimated risk difference is constant through time, namely RD, a situation which can result from lack of power to detect the time-dependence of the R D(t). The simulation results appear very interesting for late follow-up times. At time 600, results are very similar to that of the Cox proportional model. However, the PV method with identity link and without time dependence estimating a constant RD leads to a strong undercoverage demonstrating that the estimation of a constant RD may be misleading. The same simulation is performed generating times from a Cox model with a time-dependent effect for Z according to the following formula: λ(t|X,Z)=λ e l o g(1.01)X−l o g(0.95)∗Z∗log(t). In this second simulation the Cox model used with CGPM iss specified in two different ways. Specifically, the covariate Z is inserted with an interaction with log(t), the correct one, and with a restricted cubic spline of time with 3 knots. Namely the use of cubic splines for modelling time dependent effects was proposed by Hess, , allowing the study of possible covariate-time interactions without having to specify a specific functional form, using a limited number of parameters. The results are reported in Table 2. The effect of Z is multiplied by log(t). CGPM was adopted using the Cox proportional hazard regression model with the time dependent effect of Z specified in two ways: (1) with an interaction between Z and log(t), corresponding to the generating model; (2) with and interaction between Z and a restricted cubic spline of time (rcs(t)). PV model was adopted with identity link. Pseudo times were fixed at quantiles 5%, 25%, 50%, 75%, 95% of the failure time distribution. The Z covariate was inserted with an interaction with the baseline risk function modelled with a restricted cubic spline with 3 knots, giving an estimated risk difference varying through follow-up time, RD(t). In this simulation the Cox model with the correct specification of the time dependent effect of Z, that is log(t), is used as benchmark estimation. When the time dependence of Z is modelled using the restricted cubic spline, the performance of the CGPM is less appealing, compared to the benchmark, regarding all the parameters considered into the simulation. The pseudo-value model is really a competitor in this situation. It is in particular interesting to observe the 95% confidence interval width. The transformation model using pseudo-values with identity link is a valuable alternative to the CGPM when the time dependent effect in the Cox model is unknown and modelled using a flexible method. Model checking is therefore very important and pseudo-values can be of help also in this case, see the work of Anderson and Perme, . Literature data on 502 prostate cancer patients, publicly available at the web site http://biostat.mc.vanderbilt.edu/wiki/Main/DataSets, (Byar & Greene prostate cancer data), treated with different doses of diethylstilbestrol in a randomized clinical trial, , were used to estimate the adjusted treatment effect (high versus low dose) on overall mortality. Seven covariates were used for adjustment, namely: age (0, < 75 years; 1, 75−80 years; 2, ≥ 80 years), weight index (0, ≥ 100;1, 80−99; 2, < 80), performance rating (0, normal; 1, limitation of activity), history of cardiovascular disease (0, no; 1, yes), serum haemoglobin (0, ≥ 12 g/100 ml; 1, 9-12 g/100 ml; 2, < 9 g/100 ml), size of primary lesion (0, < 30 c m 2; 1, ≥ 30 c m 2), and Gleason stage category (0, ≤ 10; 1, > 10). 483 patients with complete information on the seven covariates available were considered. 344 patients died: 149 for cancer; 139 for cardiovascular causes; 56 for other causes. The estimated R D(t) according to the CGPM using a Cox proportional hazard model  is reported in Figure 2. The estimated R D(t) is increasing through follow-up time, from 1% to 5%. Correspondingly the N N T(t) is about 100 at the beginning of the follow-up time and about 17 after 6 years follow-up. The 95% confidence interval is obtained using 2.5 and 97.5 percentiles of the bootstrap distribution of the estimated R D(t) (1000 bootstrap resamples). The R D(t) confidence interval includes 0. Prostate Cancer Trial: Treatment R D ( t ). Left: Estimate of treatment R D(t) and N N T(t) in the prostate cancer diethylstilbestrol trial by different methods. Continuous line: CGPM with the Cox proportional hazard model. The estimated R D(t) is increasing through follow-up time. Broken line: CGPM with a Cox model with a time dependent treatment effect (interaction treatment by time modeled with a B-spline with 1 knot at the median of the failure time distribution). 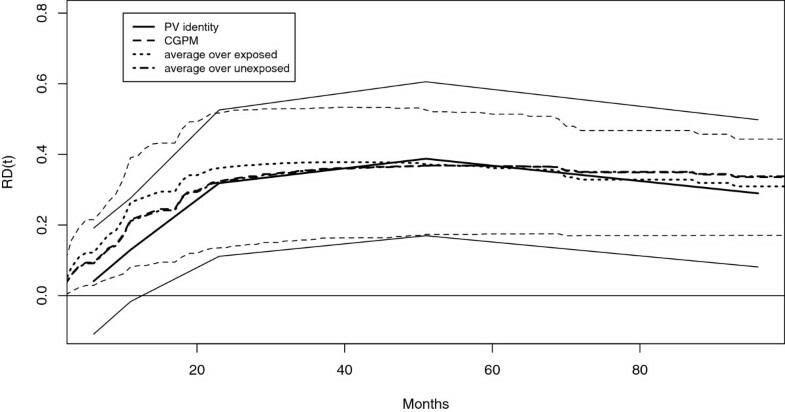 There is no treatment effect until month 20, then R D(t) increases until month 40. Dotted line: estimate obtained using the transformation model with identity link. The R D(t) estimate is negative at the beginning of follow-up (harmful treatment) then becomes positive after about 20 months (beneficial treatment) reflecting the differential impact on cardiovascular and cancer deaths. On the top: three period Cox model used by Kay. The log hazard ratio is positive in the first period (0.09) [0−13], then becomes negative in the second (-0.40), (13−32], and in the third (-0.31), (32−∞), periods. The three period model was preferred to the overall Cox model according to likelihood ratio, accounting for non-proportional hazards. Right: estimated population averaged survival probability for the two intervention groups of the prostate cancer trial. The estimate from the time-dependent Cox model is reported from left to the right. The estimate from the transformation model with identity link is reported from right to the left. It is possible to observe a crossing of the survival curves. The estimated R D(t) is based on a proportional hazard model. In fact there is no evidence for time-dependent treatment effect in Cox model according to Schoenfeld residuals. However, Kay, , carefully investigated the fit of the Cox model, dividing the time axis into three time interval: [0−13]; (13−32]; (32−∞). The log HR for treatment has a positive sign in the first period (0.09), then becomes negative (−0.40 and −0.31). Comparing by likelihood ratio the model fitted on three intervals with an overall survival model, evidence is found against the proportional HR assumption. In fact, cardiovascular deaths are more frequent than cancer deaths earlier during follow-up while, later on, cancer deaths are prevalent. Accordingly, the beneficial effect of treatment appears evident only after the first year of follow-up. The estimates obtained with the CGPM appear therefore distorted due to the use of a proportional hazard model. As a model with jumps in covariate effects at specific times is not biologically plausible, a Cox regression model with an interaction between the treatment and a function of time is used (specifically a B-spline with 1 interior knot at the median of the failure time distribution). According to the work of Hess, , splines are used to model flexibly the possible treatment time dependent effect. The estimated R D(t) according to this flexible model is reported in Figure 2. The harmful initial treatment effect is not yet captured. A transformation model based on pseudo-values with identity link is used to estimate a possibly time-dependent treatment R D(t). In order to have about 10 events between each pseudo consecutive times, 32 pseudo-times are considered at quantiles of the unique failure time distribution. In this case B-splines are used to model the baseline cumulative risk. One knot, placed at the median of the failure time distribution, seems to be sufficient to model the marginal survival function, see Figure 3. Marginal Survival function. Estimate of the marginal survival function for the prostate cancer data using a transformation model estimated with pseudo-values. 32 pseudo-times were considered. Each subject is therefore replicated 32 times in the dataset. The typical estimation of the baseline risk function is through indicator variables. In this case 32 coefficients should be included in the model. A B-Spline was instead used with one knot at the median of the unique failure time distribution resulting in 4 bases plus the intercept for modeling the baseline risk. The figure shows the estimated marginal survival with superimposed the Kaplan-Meier estimate. A backward selection procedure is used to select the time dependent effects for each covariate. The complete model has a total of 45 degrees of freedom, including the 8 covariates and their time dependent effects. The selected model exhibit a time dependent effect of history of cardiovascular disease, size of primary lesion and Gleason stage. There is no evidence for a time dependent treatment effect. The constant estimated RD is 2.2% with 95% confidence interval [ −3.5%;7.9%]. The corresponding constant estimate of NNT is about 45 patients to be treated for one patient to benefit with 95% confidence interval [ −∞ to −28;13 to ∞]. It is interesting, however, to compare the R D(t) estimated by the CGPM, which is by definition time dependent, with the one estimated through the transformation model letting the treatment effect varying in time. The results are reported in Figure 2 and summarized in Table 3. The treatment effect is harmful during the first year, while the benefits appear afterwards in agreement with the analysis of Kay  further refined using competing risks. 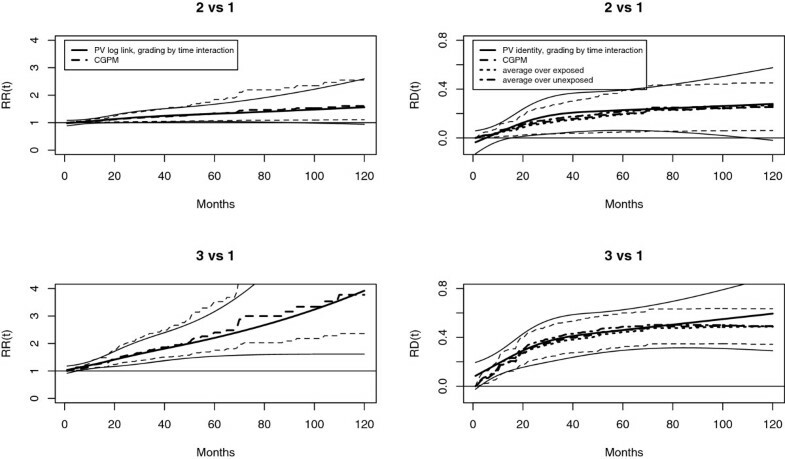 In the right panel of Figure 2 are also reported the averaged survival probabilities obtained by the CGPM using the Cox model and the transformation model both with the time-dependent effect of treatment. The plot of the averaged survival probabilities is an important completion of the R D(t) plot. In fact R D(t), as usual for the effect measures, is reducing two numbers to a single number. Retroperitoneal soft tissue sarcoma (STS) is an uncommon disease. Histologic grade and completeness of macroscopical resection are considered to be the major prognosticators for survival, while histologic type, size and age are more debated. One hundred and ninety two patients with retroperitoneal STS admitted to National Cancer Institute in Milan, consecutively, between 1985 and 2007 are considered. Patients are without evidence of locoregional recurrence or distant metastasis. The median follow-up is 54.8 moths (IQR: 25-104). Among the 192 patients included in the case series, 78 died during follow-up. For a complete description of patients characteristics see . 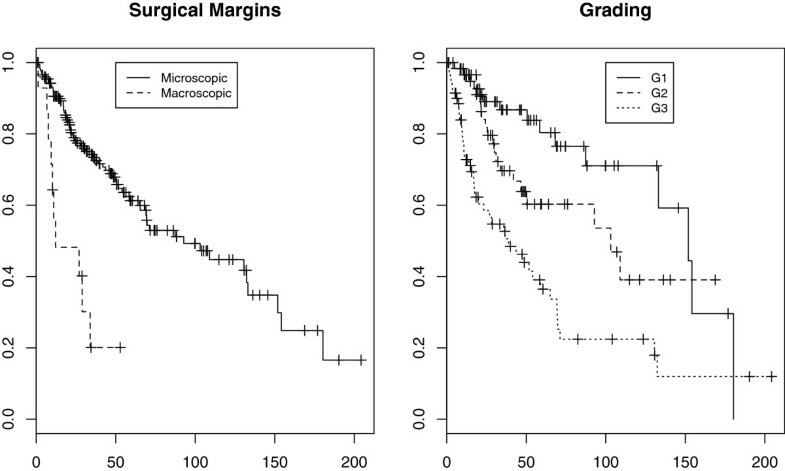 Kaplan-Meier Survival estimates for resection margin and grading are reported in Figure 4. The covariate resection margins is strongly unbalanced in this case series. No evidence for time dependent covariate effects is found using Schoenfeld residuals. A restricted cubic spline with 3 knots, for a total of 2 bases, is used to model the marginal transformed baseline cumulative survival. The fit and the monotonicity of the estimated baseline cumulative risk is controlled by visual inspection [data not shown]. A backward procedure is used for time-dependent covariate selection, fixing the significance at a conservative 0.01 level. Using the cloglog link function, no evidence for time dependent effects is found. Considering the log link, the effect of Grading appears time-varying, while using the identity link, Grading and resection margins are modelled varying in time. For the sake of completeness, the estimates of the association between resection margins and survival using the pseudo value model and a cloglog link are compared with the results from the Cox model. The cumulative constant HR is 2.4 (95% CI: 1.38−4.31) with pseudo-values. Such an association appears conservative compared to that estimated through Cox regression: H R=4.19 (95% CI: 2.04−8.59). In general it is possible to note an attenuation of estimated effects using PV and the cloglog scale, compared to the Cox model: in the case of resection margins the attenuation is quite important. Clearly, the pseudo-value model with cloglog link is of no interest in this setting, while it has an interest for model checking in Cox regression, . Kaplan-Meier overall survival curves. Patients with retroperitoneal soft tissue sarcoma. Left panel: Surgical Margins. All patients underwent surgery but some of them (14), especially those with advanced disease status, failed to have complete resection. Right panel: Grading (1: 60; 2: 62; 3: 70). Also the constant RR estimated using pseudo values and log link appears conservative: RR = 1.3 (95% CI: 1.03−1.71). A comparison of the estimated R D(t) obtained with pseudo values and identity link with the estimates obtained using the CGPM is reported in Figure 5. Different averaging procedures are also reported. The estimated R D(t) and point-wise confidence intervals using the different methods are in close agreement. The different averaging procedures yield quite similar results in this case. According to pseudo-values, the R D(t) reaches a maximum value at 60 months and is about 40%. Retroperitoneal soft tissue sarcoma: Margins. 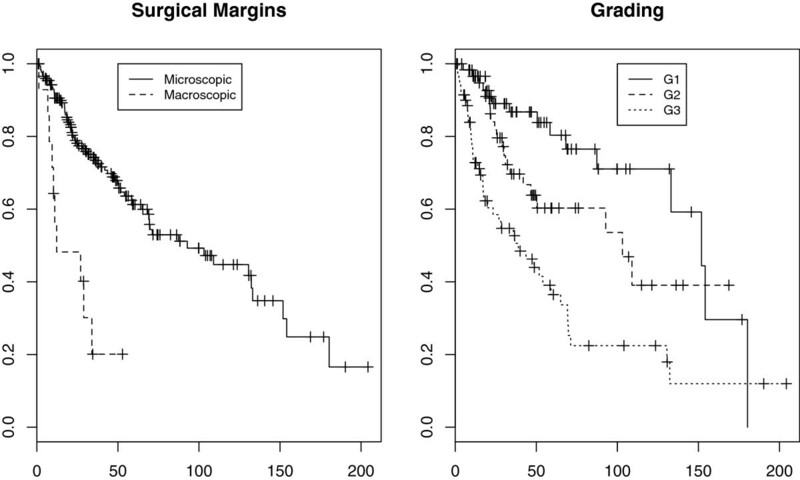 R D(t) of extension of resection margins estimated using different methods. 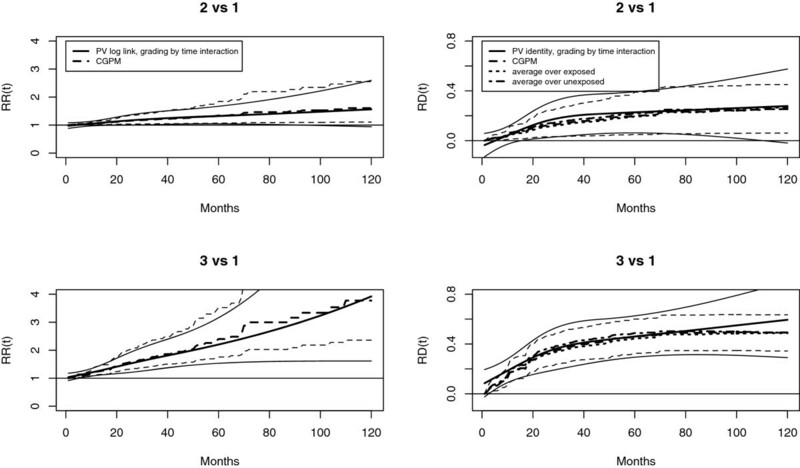 PV identity: estimated effect using pseudo values, identity link and interaction between time and margins. Five pseudo times were used at times 6, 11, 23, 51, 96, corresponding to quantiles 10%, 25%, 50%, 75%, 90% of the failure time distribution. CGPM: Corrected group prognosis method using a proportional hazard Cox regression model. The averaging is performed on the whole sample of patients. Other two measures are reported: (1) average over exposed: obtained averaging only on patients with macroscopic resection margins (E I N(t)); (2) average over unexposed: obtained averaging only on patients without microscopic resection margins (N N E(t)). According to Cox regression the HR of grading 2 vs 1 is 2.56 (1.27−5.16). The estimate obtained through pseudo-values and cloglog link is 2.34 (1.27−4.32). There is still an attenuation but not as huge as in the case of margins. However, considering grading 3 vs 1 the attenuation effect is more evident: the HR from Cox regression is 6.49 (3.31-12.75), while using pseudo-values is 4.88 (2.54-9.39). The R R(t) and R D(t) are reported in Figure 6. After 8 years the R R(t) is 1.6 and 3.1, and the R D(t) is 36% and 59%, for 2 vs 1 and 3 vs 1 contrasts, respectively. Also in the case of grading, the estimates obtained using pseudo-values and those obtained using different averaging procedures from the Cox regression model appear in good agreement. The quantification of effects through risk differences may be very important for the clinical management of the disease. Retroperitoneal soft tissue sarcoma: Grading. The effect of the different Grading categories on the R R(t) and R D(t) scales are reported, using different estimation methods. CGPM applied to a proportional hazard Cox model; PV with log and identiy links and interaction between time and grading. The estimates obtained with the different techniques appears quite in agreement. No evidence for time dependent effects in the Cox model was found. In survival analysis the adjusted measure of association everywhere adopted is the hazard ratio. Although the efficiency of the hazard ratio makes it attractive for hypothesis testing, it may not carry the most useful information for clinicians/biostatisticians. Schechtman, , suggests using also absolute measures in conjunction with relative measures of covariate-outcome association. To provide adjusted measures of association different from the hazard ratio, a simple strategy is going through the calculation of the predicted probabilities of event for an “average” subject, the so called “average covariate method”. Such a procedure estimates the measures of effect for an hypothetical average subject and not population averaged estimates. An alternative idea to provide adjusted summary measures of effect is the corrected group prognosis method [27, 28]. Extending this idea, using the concept of counterfactuals, Laubender and Bender  proposed methods for computing such population measures taking into account the confounder distribution. Bootstrap is then used to obtain pointwise confidence intervals. Such approaches are particularly appealing as they may adopt the Cox regression model which is widely accepted in medical literature. However the Cox model may easily not be the best regression procedure to be applied, simply because of the assumption of proportional hazards. In fact, in presence of time dependent effects Cox regression may be less appealing. This is demonstrated here through a simple simulation. When time-dependent effects in the Cox model are specified using well-known flexible methods, , without committing to a specific functional form, the estimates are not optimal, especially in terms of efficiency. In these circumstances the results of the simple simulation presented here, suggest that the use of the pseudo-value model may represent a valid alternative to the CGPM. The simulation is not exhaustive and more work is needed to fully understand the properties and the relationships among the different estimation methods. Considering a similar problem in the context of logistic regression, Gehrmann and colleagues, , concluded that the CGPM applied to logistic regression is the preferred method to estimate RD and NNT adjusted for covariates compared to binomial, Poisson and linear regression methods that directly estimates the RD (similar to pseudo-values with identity link) even if the fitted response function differs from the true response function. The context of time-to-event outcomes is more complex than that of logistic regression especially for the problem of time dependent effects. Whether similar results hold for the Cox model has therefore to be further explored thorough a series of simulation studies. In any case, when using the CGPM, the basic model used to obtain event probabilities during follow-up has to be adequate. This means, for example, that the proportional hazard Cox regression should not be applied if the proportional hazard assumption is not satisfied. In clinical literature, results of statistical analysis are commonly reported in terms of regression coefficients and their confidence intervals. Applied survival analysis resorts entirely to the Cox model which is a particular case of transformation models. Transformation models include also the accelerated failure time models providing a variety of measures of effects to be considered. It is to be noted that, additive and multiplicative-additive hazard regression models,  are not comprised in this class. The estimated coefficients are differences of hazard rates rather than ratios. These models were mainly proposed to improve the fitting where the proportional hazards model is not adequate or to check for proportional hazard assumptions. Moreover, the measures of impact provided are still based on hazards. In this work a simple approach to obtain point and interval estimates of association measures, by using transformation models through suitable link functions, is presented. The general technique of estimation based on pseudo-values proposed by Andersen and colleagues  is used as it is simply implementable with standard software. Other techniques could have been considered to estimate the transformation models. In this context, it is of particular interest the estimate of the baseline survival function to model time dependent effects. Therefore, semi-parametric techniques (see for example ) are not of interest here. Maximum likelihood (ML) estimation can however be conveniently used. Royston and Parmar proposed ML for transformation models with cloglog and logit links, , which are, however, the links of less interest here. Moreover as the pseudo-value is defined between the first and the last pseudo times (which are not the first and last event times) it still makes sense to have a constant RD model. In fact considering the whole follow-up time interval, and especially the beginning of the follow-up, R D(t) estimates should instead always be time-dependent. From the methodological viewpoint, the only difference introduced in the presented examples with respect to standard applications of the pseudo-value model is the use of spline functions to estimate the transformed baseline survival. This modification is without practical efforts, considered the wide availability of software to compute spline bases. From the modeling point of view, care must be paid to the monotonicity of the estimated transformed baseline survival function. In general, provided the number of knots is limited, no problems of non monotonicity were observed. Another issue concerns the possible simultaneous use of different association measures estimated through different link functions in a transformation model. In such a case, practitioners must be aware that, due to lack of power, not all time dependent effects can be correctly specified, and likely the different models cannot hold simultaneously. In such a case, if different measures are of interest, different models can be used simultaneously only if the results are in agreement with each other. From a theoretical point of view, cloglog and logit links guarantee that the estimated probabilities are within the range 0-1 but this is not guaranteed if log or identity links are used with standard software. Research is in progress to face this issue. The use of different link functions in transformation models has been studied by several authors simply investigating the goodness of fit of the different links [40, 41]. The alternative perspective considered here, evaluates the use of different links with the goal of providing suitable measures of association between covariates and outcome. As a consequence, when a specific link function is chosen, it should be expected the need to include time dependent covariate effects into the model. Transformation models estimated through pseudo-values appear an easily implemented alternative to the available approaches mainly based on Cox proportional hazard model to obtain adjusted measures of association eventually time-dependent also for continuous covariates. The study was partly supported by the AIRC grant IG-2012-13420. The Authors wish to thank Dr. A. Gronchi for providing data about retroperitoneal soft tissue sarcoma patients. FA drafted the manuscript, designed the study and performed the analyses. EB participated in the design of the study and revised critically the manuscript. PB participated in the design of the study and revised critically the manuscript. All authors read and approved the final manuscript.